What would The Beatles have sounded like if they had had the chance to perform songs such as “Penny Lane” and “A Day in the Life” in front of a live audience? Grand Rapids had its answer, thanks to the Grand Rapids Pops with special guests, Classical Mystery Tour. 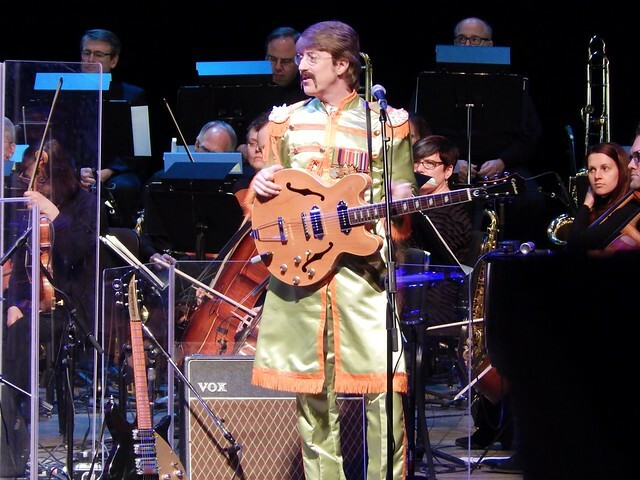 Classical Mystery Tour returned to West Michigan for a special 50th anniversary salute to The Beatles’ Sgt. Pepper’s Lonely Hearts Club Band that had the audience singing along, dancing in the aisles, and cheering loudly for their favorite Beatles songs. More than 4,000 filled DeVos Performance for three shows held Friday, April 28 through Sunday, April 30, to close the Grand Rapids Symphony’s Fox Motors Pops series. From “Got to Get You Into My Life” to the audience singing along on “Hey Jude,” Beatles fans traveled back in time to the 1960s along with Jim Owen, Tony Kishman, Tom Teeley and Chris Camilleri appearing as John, Paul George and Ringo, performing two dozen Beatles tunes exactly as they were recorded. What’s more, Classical Mystery Tour donned mustaches and kaleidoscopic Sgt. Pepper uniforms for the show led by Grand Rapids Symphony Principal Pops Conductor Bob Bernhardt. Highlights featuring the Grand Rapids Symphony included "Yesterday" and "Eleanor Rigby" featuring the symphony's strings; "Penny Lane" with its famous piccolo trumpet solo by principal trumpeter Charley Lea; and the entire orchestra on songs including the adventerous "A Day in the Life" and the exciting "Live and Let Die" from Paul McCartney's solo career post-Beatles. Classical Mystery Tour, including former cast members of the Broadway stage revue, Beatlemania, has toured across the United States, appearing with over 100 orchestras over the past 20 years including the Grand Rapids Symphony. The group’s last appearance was in July 2014 for the D&W Fresh Market Picnic Pops at Cannonsburg Ski Area. You might say it’s the best show the Beatles never did.